← I Ate a Good Meal. Lovers Give Diamonds. Dog Owners Give Harnesses. My Boston Terrier, Winston, is zealous about his daily walks. Despite thousands of dollars on private training for this pup, he insists that strolls are for geriatric dogs and an Alpha like him needs to seize the path. He is an explorer, a canine Lewis and Clark. He is incapable of walking a straight line, and he pulls to lead the way, then stops abruptly to sniff some grass or inspect a tree. To get him back on track, I have to tug on the leash. He is such a rambunctious, erratic walker, that it took a toll on my hands, and I ended up with something called “trigger thumb,” which basically meant my thumb squeaked when I bent it, and it throbbed considerably. I was able to fix the pain through the help of a doctor, but, the saga with Winston and his walks continued. My main concern was that he would break free of the harness.Thankfully, he never did, but the fear lingered. He was running through harnesses every three months. They would stretch out and the rapid aging reminded me of the before-and-after photos of presidents at the end of their term. I took Winston to my favorite dog store in Studio City, Maxwell Bark, and the sales lady, after taking one look at him, pointed me in the direction of some dog harnesses made by Puppia. I have not looked back since, except when I’m having to pull Winston on a walk. His Puppia harnesses, tough as they are, lasts about a year before I start feeling like it needs to be replaced. Being a fan of Puppia, I Liked their Facebook Page, and as I scrolled down the wall, I realized something: I have never seen such passionate brand advocates on any Page. I am the primary social media person for my company, and I wish I had the raving lunatics they have. So what is the lesson learned here? If your product solves a problem, people will love you. Sure, but why does this page have fans taking the time to upload shots of their dog, wearing Puppia clothing and harnesses, and saying things like, “I will NEVER use another brand”? I think its the combination of solving a problem and love. Dog owners love their dogs, some of them as deeply as others love a child. I haven’t investigated any children product sites, but I wonder if there is a great brand, that solves a problem for moms and has them raving? Being in the jewelry industry, I think of jewelers, and how many of them desire that level of brand advocate that Puppia has. You would think that a diamond ring would engender the same kind of ardent appreciation, and it comes close, but not quite. Diamonds represent love. A dog harness represents keeping a loved one safe. Maybe it’s not a stretch to say that a harness is a dog owner’s version of a diamond. It’s what we give our dogs to show love. Puppia has pulled off the ultimate sales and marketing trick and built a better mouse trap. This reinforces a lesson taught in any Marketing 101 class, but is often overlooked: The very best marketing concepts fail when the product doesn’t live up to the hype. Let’s face it, without a great product, you’ve got one out-of-control dog with a weak harness. 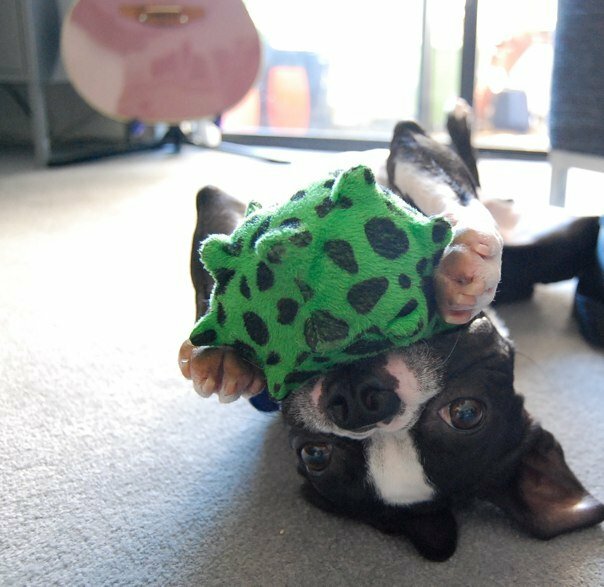 This entry was posted in Brand Management, Great Marketing Examples, Smart Business Practices, Social Media Practices, the Boston Terror Terrier and tagged Boston Terriers, dogs, harnesses, Puppia, Winston. Bookmark the permalink.